What happens when you plug in the wall charger ? Wall charger is connected to mains. No load is present. Then we add a resistive and capacitative load and observe the result. Wall charger is connected to the load but not to mains. 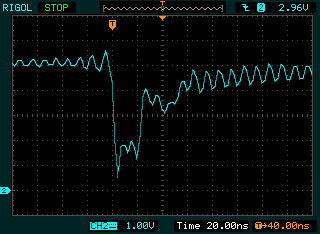 Then we switch on mains and observe the result. Note that the high noise levels are caused by the test environment, not by the charger itself. Mains voltage is nominally 220V/50Hz (Argentina, not Europe), measured to be in the range 217-220V. 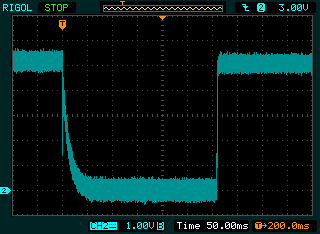 Wall charger output after sudden application of a load of 10R, 10R with 100uF in parallel, and 10R with 470uF in parallel. 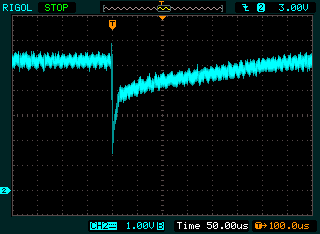 Recovery from the load change from zero to 0.5A is remarkably quick, reaching nominal values within only about 100ns. The 100uF capacitor, which is ten times the maximum capacitative load permitted by the USB spec, slows down recovery by about three orders of magnitude. The 470uF capacitor seems to trigger a short-circuit protection, causing the charger to disable its output for about 300ms. Wall charger output if plugged into mains, with the following loads: none, 10R with 100uF in parallel, 10R with 470uF in parallel. 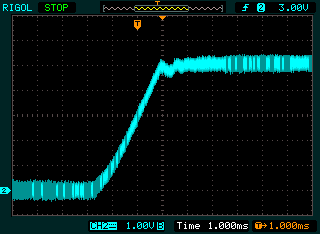 In all cases, the USB voltage ramps up to nominal values within 2-3ms, without excursions.